WordPress was originally structured to be a blog (short for weblog, an online journal) software, but has since expanded to be a fully-featured Content Management System. 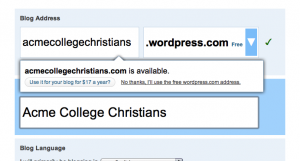 It’s the most popular of the CMSes we’ll look at this week, which means there are plenty of other campus ministers with experience with it–and, there are many, many plugins available to help you do whatever you want with it. Simple-to-use, but with a lot of potential for power. It’s built for people who know very little about hosting web sites; there are even prompts to teach you how to buy your own domain name and point it to your new web site. Great user community: There are tutorials and blogs and forums everywhere about WordPress. It’s very easy to find someone who can help, even if you need to pay a developer to do a little work for you. A lot of customizations that are free with a self-hosted WordPress account (like custom CSS) cost money for a WordPress.com account. It’s built for blogging, so you have to tweak a few settings to create a non-blog-based web site. If you want to follow WordPress’s guide to getting started with their service, go for it–this is just a simplified intro to the service. Be warned, though, that their intro is just a bit out of date, so a few details might not click. OK, if you’re reading on, we’ll get started with setting up your first user account and site. 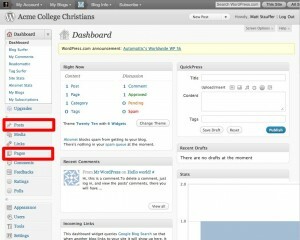 Once you create a username and password and your new blog, log into your dashboard. To get on your very basic feet, you’ll need to learn about two things: Pages vs Posts and Themes. With WordPress, there are two primary types of content you can generate. First, you can generate posts, which are content that has a time and date attached to it. Think of posts as blog posts, or articles, or news items. Second, you can generate pages, which are (relatively) static pieces of your web site. For example, the “about” page on Staffhacker is a WordPress page. We’ll assume that you don’t want to have a blog for now, so just completely ignore posts for the moment. Instead, let’s tweak one setting to make your front page not show blog posts. By default, the front page of your site shows all of your most recent posts. But since we’re not blogging, we want to change that. First, we need to create the new front age. So, click the Pages button in the left nav bar. Once that page opens, click the “Add New” button. Name the new page “Front Page”, type a little gibberish in the main edit field, and click “Publish.” We’ve just created the front page for our site–but the site doesn’t know how to make it be the front page. Now, find the button for Settings in the left toolbar, and click it. Now click Reading underneath it. Click the Save Changes button at the bottom, and now view your page; voila! It’s now displaying your gibberish front page. Your next most important step (after creating quality content) is to customize your theme. 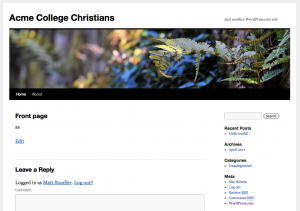 WordPress.com defaults to the Twenty Ten theme, which is clean, simple, and pretty customizable. If you click the Appearance button in the left nav bar, you’ll see the ability to change the header image, background colors, and adjust some widgets. However, if you don’t like Twenty Ten, click the Themes button (the top button of the list underneath Appearance), and choose a theme you like from the list there. All of these themes are free, unless they’re marked with a “Premium” icon. That’s the very basic basics of setting up a WordPress page. Feel free to ask questions here about your experience here, or suggest a post (up top, labeled “Suggest a Tip”) teaching you what you want to learn. But also know that the WordPress community is vast, and a quick Google search will answer most of your questions.